Dubai International (OMDB) airport scenery. Finished and Operational Concourse 3. Safegate Docking signs at all gates. Pre-rendered Self-Shadowing and custom reflection maps. Custom Specular and Reflection maps (FSX&P3D only). Animated apron vehicles and static objects. 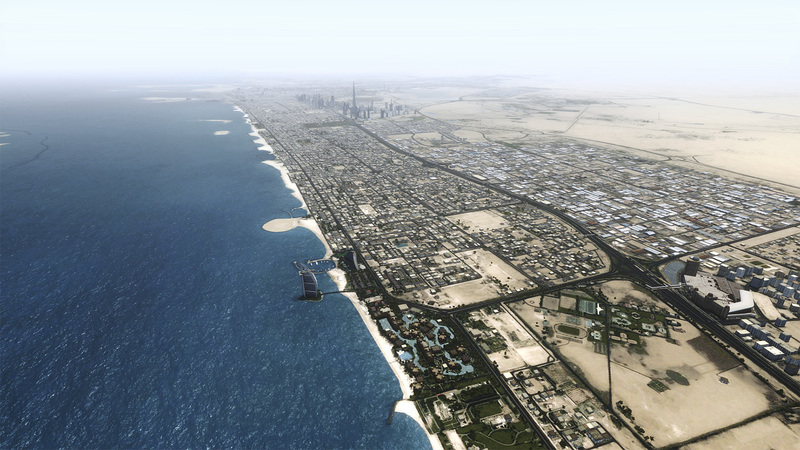 Dubai city featuring Mesh, Photo and numerous custom buildings. 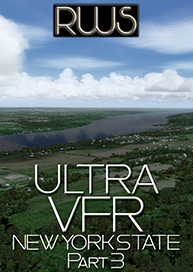 18 landable Heliports throughout the city (FSX&P3D only). Very good frame rates on a mid system using windows 7, especially just above the airport and even over the city itself, which is quite detailed! A must own scenery for Dubai. I didn't expect much, but what I got is really overwhelmed. It's really beautiful and highly fps friendly with a lot of eye candy. 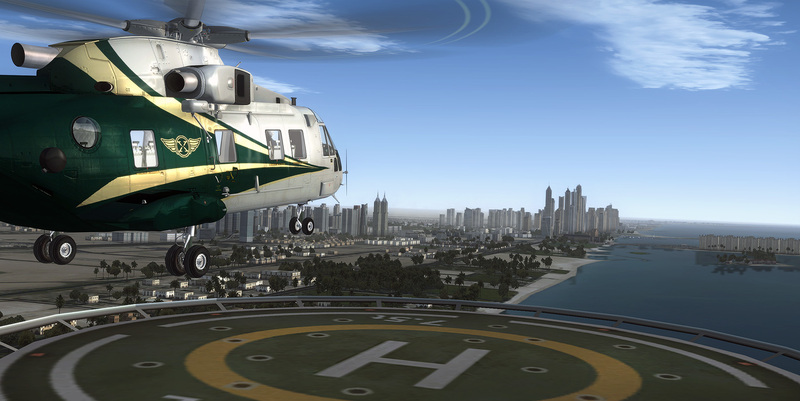 Flytampa's Dubai fit very wonderful with Night Environment Dubai from Aerosoft. The combination of these is a jaw dropper. Great scenery, beyond all expectations...! Both the city and the airport are beautifully made, with detailes and FPS super friendly! Worth every cent! Go for it!!! Stunningly beautiful!! What can I add to all the other reviews? Hardly touches FPS and the city amazing in every aspect. Even when the wind is strong, you will get sand blowing! I go out of my way to fly here just to impress non-flyers. I sent my airline pilot friend a few screenshots of this from over the wing and he asked me "When did you go to Dubai?" ;-) He was convinced I was really there. All I can say is Get it now! Beautiful! So much to explore beyond the airport. Didn't notice any frame rate hit. This has stood the test of time and is simply a visually stunning recreation of not just the airport but also the local city environs as well. It has become the benchmark of scenery that all other developers aspire to. 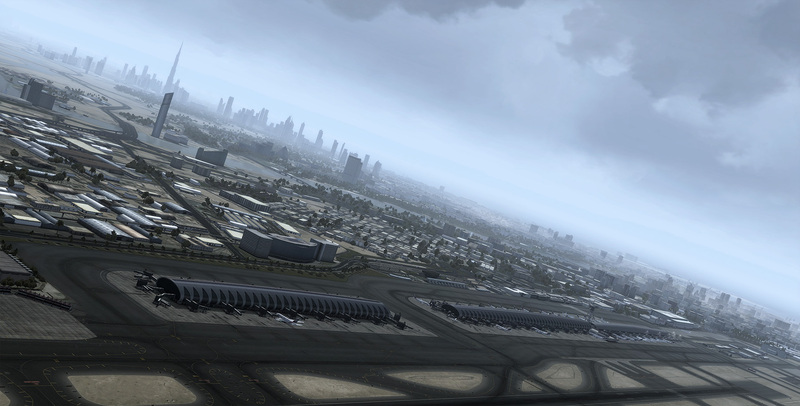 If you have the PMDG 777 package, Dubai is a global hub airport that will give you endless hours of simulated flying enjoyment. 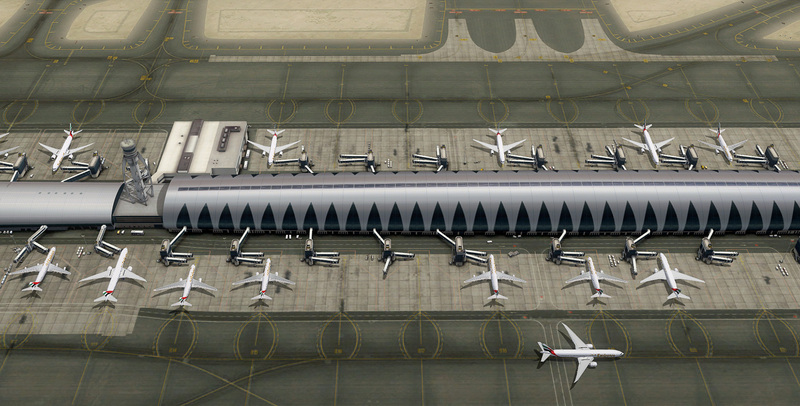 One of the best airport sceneries that have been created for both FS9 and FSX! Spectacular Quality of the buildings including the airport terminal buildings as well as the Dubai skyline. THE PALM Island and sights such as the Burj Khalifa and Burj al Arab make it seem as the real Dubai! Even the smallest details have been added! This includes Dubai Mall the metro, and the marina! VERY Very Impressive Scenery! Arguably on the best addons out there!! Highly Recommend this airport without any doubt. 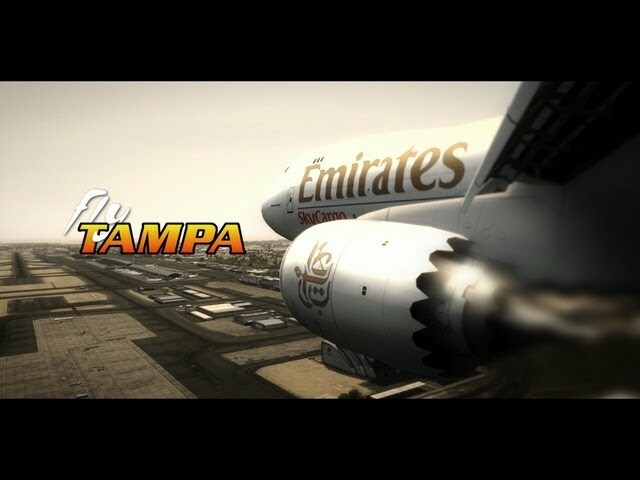 Flytampa truly recreates the hub of emirates airlines in a fantastic and stunning way! How many years did I wait ? 5 years !! 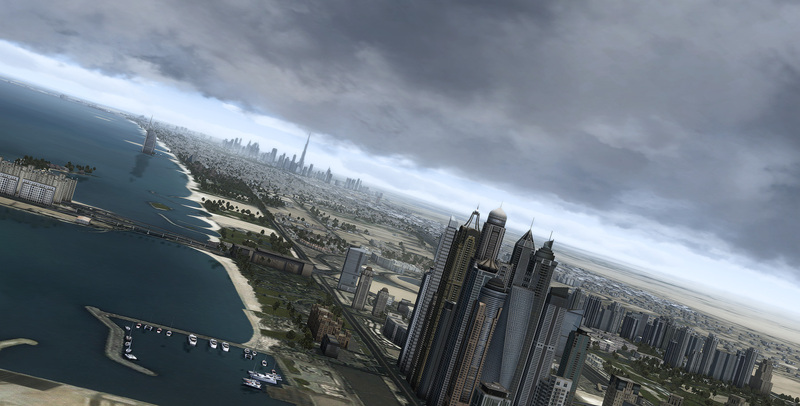 Finally someone really create a great realistic scenery of Dubai for FSX . 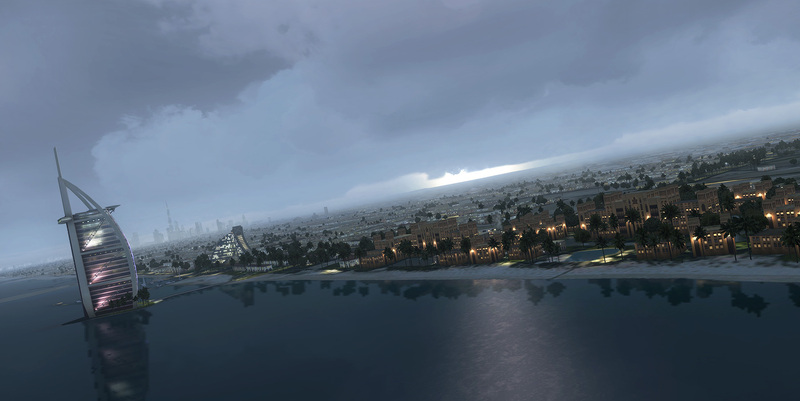 I been there in 2010 , when I fly over different districts in FSX , it brings me back good memories . 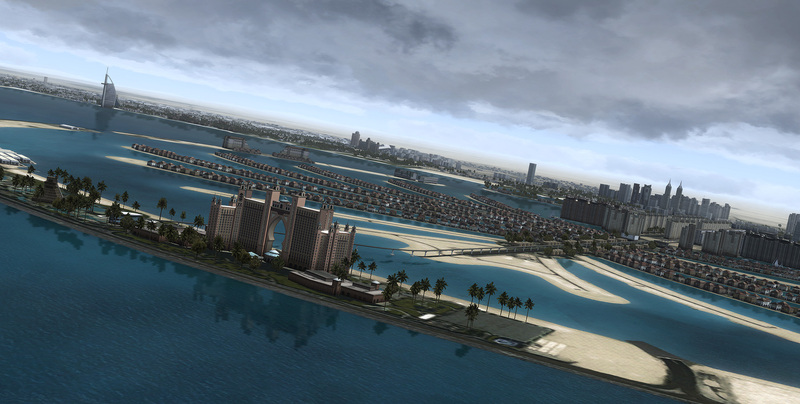 I also took a real helicopter ride from Atlantis Hotel above Palm Island and rest of Dubai , I can tell its 90% close to the real thing , but understand there's limitations on FSX , developers cant make everything . 5 stars ! For such huge scenery with nice frame rates , highly recommend everyone to buy it . At least in the city, the airport as all FlyTampa's products is full of fine details. Few days back I was flying from Shanghai to Doha. While banking over DXB at night , I could not find any difference between the Flytampa Dubai Rebooted and the real scenery I was looking below. Just 1 word : A-M-A-Z-I-N-G !!!! In my mind, it's the best scenery for Flight Simulator! Bravo !!!! 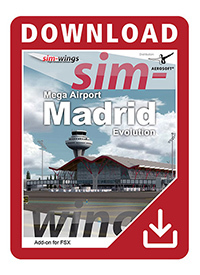 This is my first review here at Simmarket (although I am a long time customer and FS9 user since many years ago, incl many free and commercial addons). I feel everything's been said about this excellent add on by previous reviewers, so I'll keep brief: Both the airport and the surrounding area seriously look very beautiful, with a wonderfully high level of attention to detail. One can immediately see how much time must have gone into research and development! As stated above, I own a lot of payable scenery addons for FS9: Many are nice, some great, but only very few excellent. I feel secure to state that Flytampa ALWAYS delivers the highest quality standards only (I also own the Boston and Vienna sceneries). Both thumbs up: "Dubai Rebooted" is worth every cent you pay for it! Awesome, awesome! Nothing at all negative about OMDB. The airport is extravagent, the buildings are well done and accurate and the frame rates are exceptional. Well worth the investment. I love this fly tampa which has created real scenery... thanx to fly tampa.. Fantastic scenery! This airport will get alot busier online now. Brilliant buy. Well done. Just bought the product, Superb that's all I can say! Tampa have once again produced a high quality piece of Software. For any Virtual Pilots / Virtual Airlines who use Dubai, this is a must have. The problem with these reboots is that now you want FlyTampa to reboot all their sceneries, or even the whole universe, given that they are the best scenery designers around. 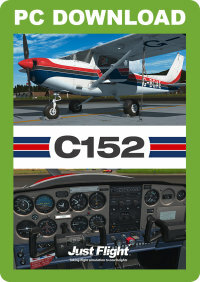 For those who are discovering MS Flight Simulator or Prepar3D this is a must have, no questions asked. I don't even have to say what to do for those that already know FlyTampa's excellence and quality. Fly Tampa surprised us by not only rebooting the airport, but by reproducing the entire city. It is a masterpiece! This will be my hub for my PMDG 777X! One of my very very best sceneries in Fs2004, great fps and great surrounding. The only thing that I miss is moving vehicles on the airport and AES lite system, would have been superb. Excellent rendition of Dubai and OMDB with zero FPS impact on my 4 year old system. I was able to bring up Google Maps and find the hospital and fly to there in the scenery. Great job FlyTampa! Where is the Sixth STAR!!!!******. UNreal you're loosing out FSX at its best..what are you waiting for???? In my opinion FLYTAMPA is simply the best!! 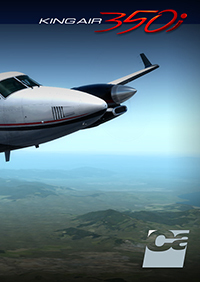 !Awesome megascenery for both flight simulator 2004 and fsx!! 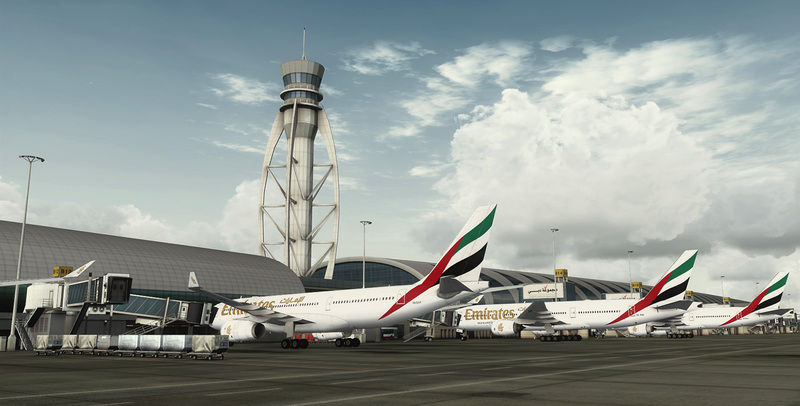 !Extremely detailed and realistic representation for both Dubai international airport and the wonderful city of Dubai! !I have been there many times and this megascenery is like the real thing!! !Keep up the perfect job guys!! h every cent! Go for it!!! Stunningly beautiful!! What can I add to all the other reviews? Hardly touches FPS and the city amazing in every aspect. Even when the wind is strong, you will get sand blowing! I go out of my way to fly here just to impress non-flyers. I sent my airline pilot friend a few screenshots of this from over the wing and he asked me "When did you go to Dubai?" ;-) He was convinced I was really there. All I can say is Get it now!